Ed and I finally dragged my mother to the La-Z-Boy store and got her to buy a new recliner. We'd been to the store ourselves to find her a chair, but she really needed to sit in it herself and see which one she liked. My mother is 5'4" tall, I'm 5'8" and Ed is 6'1". We all have different needs in a chair and although we had favorites, the ones we liked might not suit her. 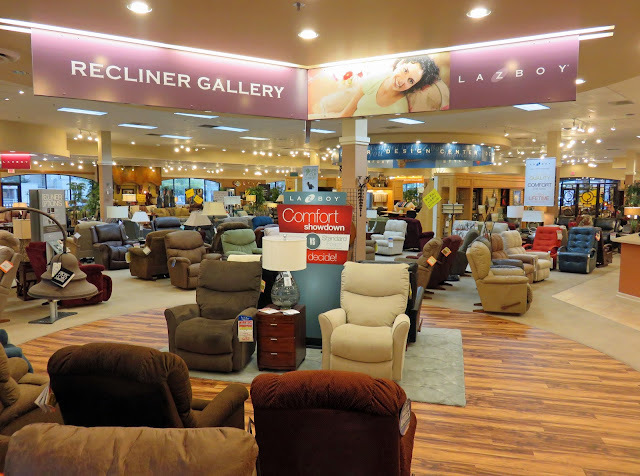 I've gotta tell you, recliner shopping is the best kind of shopping there is. You sit in the most comfortable chairs on earth, one after the other after the other, to decide which you like best. And while you're comparing features and discussing fabrics with the salesperson, you're still sitting in a La-Z-Boy. It's the most relaxing retail outing I've ever had. There are only a few shopping experiences that top this. Shopping online at home, in your underwear. Or, cake tasting for a wedding. I've never done the latter but I think it's probably pretty damn good, eating cake samples all afternoon. So, my mother walked away with a brand new chair to be delivered in a few days, and I didn't have to traipse around the mall removing and replacing my clothes while bitching about how hot it is. I like chair shopping so much better. And no one I know has ever uttered "Does this chair make me look fat?" when trying a recliner on for size. If It Won't Fit, Don't Commit!